RightsViews reported live from the panel, which featured four speakers including leaders of grassroots movements and human rights scholars. 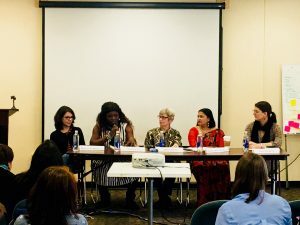 The panel was moderated by Sheila Dauer, the former director of Amnesty International USA’s Women’s Human Rights program and a faculty member of the Institute for the Study of Human Rights at Columbia University. The panelists talked on a range of issues, covering women’s social and economic rights, and acknowledging realities of discrimination and violence that challenge rural women’s empowerment on a daily basis. 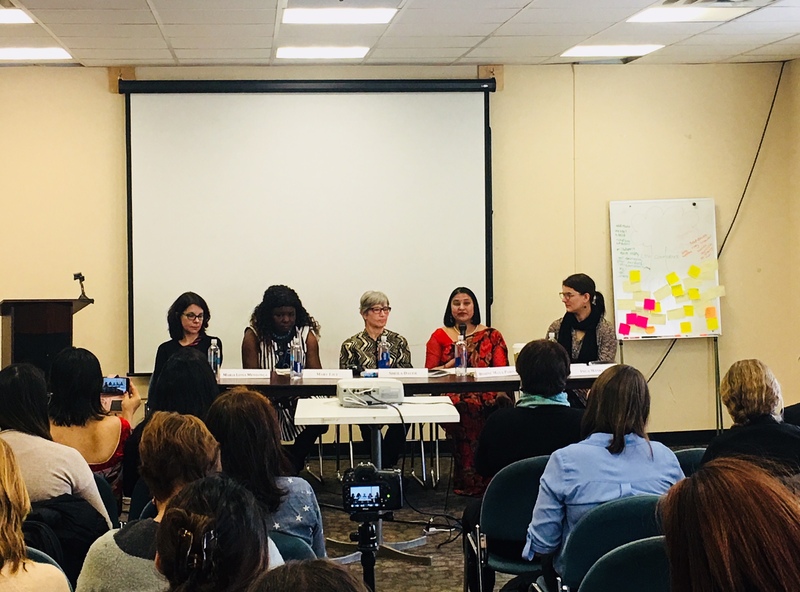 Two of the speakers have worked at the grassroots level organizing women farmers, one organized Dalits (members of the lowest caste in Nepal), and the final speaker worked at the UN-level on water and sanitation issues. The first speaker was Maria Luisa Mendonca, who has done grassroots organizing in Brazil and specializes in agricultural systems, rural movements and natural resource conflicts. The founder of the World Social Forum and director of Brazil’s Network for Social Justice and Human Rights, she is currently a visiting scholar at the Graduate Center of the City University of New York. She emphasized the big picture, noting that the challenges of rural women are operating within much larger geopolitical conflicts including competition for mining resources, land, water, and oil. 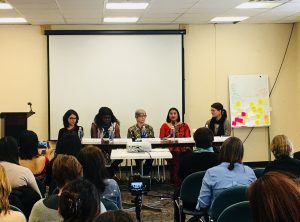 In order to empower these women, she argued, we need to connect their experiences with issues of concern to us all, including promoting formal property rights, land use access, housing, and general empowerment. Pointing to Brazil, she indicated that subsistence agriculture is a largely invisible segment of the economic data, with only large-scale agriculture counting in GDP. This reality limits opportunities for rural women, who would benefit from greater advocacy for subsistence agriculture in data systems, she said. In Brazil, women also face additional challenges such as displacement by private militias favoring monocrop agriculture. 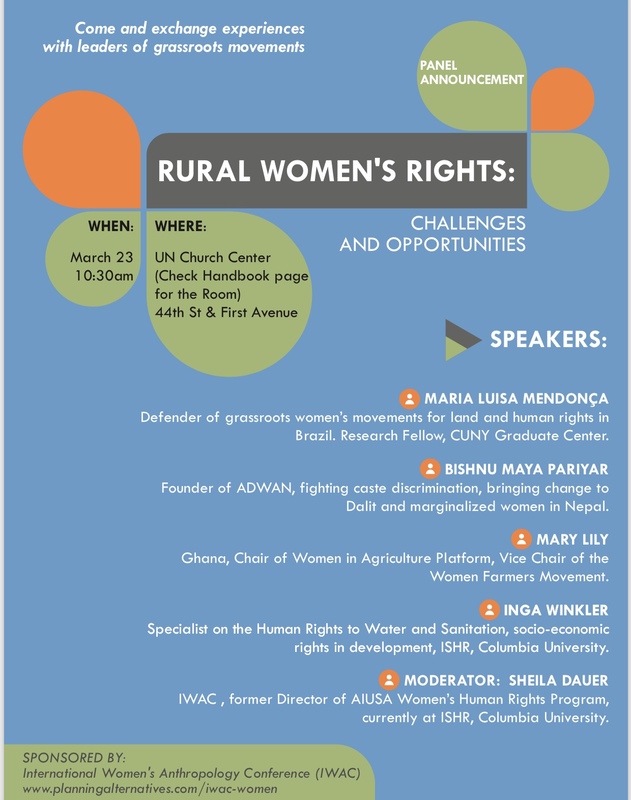 The next speaker, Mary Lily, is the chair of the Women in Agriculture Platform in Ghana and vice chair of the Women Farmers Movement. Her grassroots activism has advocated for unpaid care work recognition, redistribution, and women’s representation. She spoke about some of the diverse challenges faced by rural women in Ghana, including domestic violence, sexual harassment and high rates of teenage pregnancy. In addition, she pointed to access to land for productive use and access to water as big problems facing rural women. In a rural community of 5,000 people, for example, she said there are only two borehole wells. The solution? Collective action: regional groups need to come together to create a unified platform, engage with chiefs of communities, and get by-laws written. Furthermore, she said, poverty should be eradicated. The third panelist, Bishnu Maya Pariyar, recalled her childhood as a member of the lower Dalit caste in Nepal and the challenges that led to her current advocacy work for domestic violence victims as the president of the Association for Dalit Women’s Advancement of Nepal (ADWAN), which she founded at the age of 20. ADWAN works to support marginalized communities in Nepal by fighting caste discrimination and building grassroots organizing, human rights training and development. She told the story of her life as an activist, which began when she was just 10 years old and witnessed a local woman crying as her husband beat her because she was a Dalit woman. Pariyar saw the need to find tools to empower similar women and bring the different castes together to address common issues for women across the caste system, including problems such as domestic violence and gender discrimination. She called for greater representation of grassroots women in the UN system and at next year’s session, with more efforts made to translate discussions and get the women to the meetings despite visa challenges. 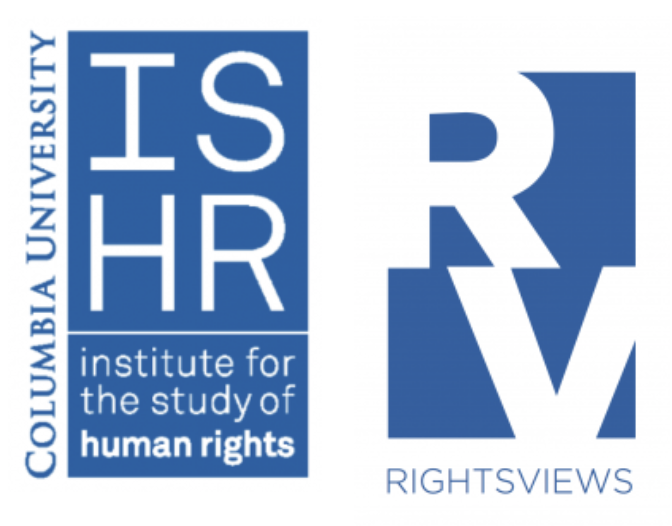 The final speaker, Inga Winkler, a lecturer in human rights at the Institute for the Study of Human Rights at Columbia University, turned the conversation closer to home for Americans. 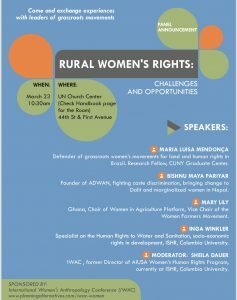 As the legal advisor to the first UN Special Rapporteur on the Human Rights to Water and Sanitation, her talk focused on rural women and sanitation rights. She spoke about women in the rural United States, where poverty is an issue due to structural conditions and discrimination. She cited rural Alabama as an example, where one sparsely-populated county is 70 percent black with an average income less than $30,000. In this community, there is no municipal sewerage, so many of these women rely on septic systems or on-site sanitation systems, which they are expected to install despite little income, leading them to instead rely on piping systems that drain into cesspools on their property, creating health hazards. Following these brief remarks by the panelists, moderator Dauer turned the discussion to a final question and answer session, which reiterated many of the main points of the conversation. 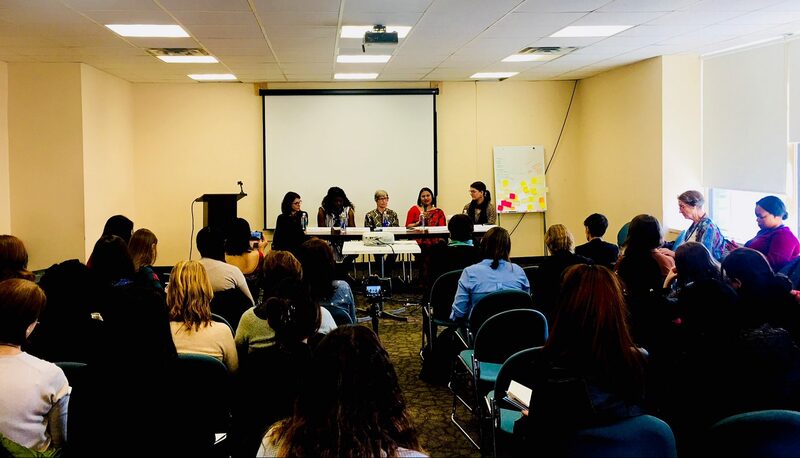 The speakers agreed that the takeaway theme of the discussion was positive change comes from collective power; “when women work together, they can accomplish a lot.” Rural women should be brought to the table for important conversations so that they can be empowered and their concerns heard. Ashley E. Chappo is a Master of International Affairs candidate at the School of International and Public Affairs at Columbia University and a recent graduate of Columbia Journalism School. She concentrates in human rights and humanitarian policy and specializes in international conflict resolution. She is editor of RightsViews.